Do not do more than once a month on a regular basis as the diuretic effect may deplete the body of essential water soluble vitamins and minerals over time. The diuretic effects of this kidney detox formula may enhance the toxic effects of certain medications, such as digoxin (used for congestive heart failure), phenytoin (for seizures), anticoagulants, and others. For this reason, people taking prescription medications should not use a kidney detox formula like this without first consulting a health care provider. For most people, doing this kidney detox twice a year should be enough to keep the kidneys functioning properly. 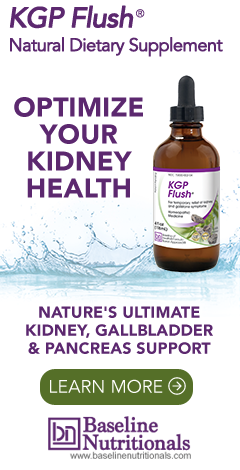 An ideal time to do the KGP Flush® is shortly before doing any liver detoxification. Again, the same herbs that promote easy flushing of the kidneys will also help prepare any stones in the gallbladder and pancreas for flushing. Using KGP Flush® shortly before doing the liver detox will greatly reduce the likelihood of discomfort when going through liver detoxification while at the same time optimizing kidney health. If using in preparation for liver detoxification, make sure you start your liver detox within 30 days of starting the kidney detox so the gallstones and pancreatic sludge don't get a chance to re-harden before flushing. For those who have a predisposition to kidney problems or gallbladder problems, this program can be done once a month to minimize the chances of any future occurrence. The best is to mix a 4 ounce bottle of KGP Flush® with a quart (32 ounces) of fresh squeezed apple juice (not bottled) and a quart of water. Drink a pint each day over the next 4 days. If you miss a day, do not double up on your dose the next day. Just add a day to the program. A flush is defined by finishing the entire half gallon of liquid. Even though you can mix with any juice or water you want, apple juice is especially good as it is high in malic acid, which assists in the "dissolving" action of this kidney detox formula. Make sure that you use fresh organic apple juice -- not the bottled cooked apple juice found in most supermarkets. Note: you can buy refrigerated fresh organic apple juice in many stores including Whole Foods and Trader Joes. Also, make sure you dilute the juice and spread its consumption out over several days. You can also juice your own organic apples and mix with water. If you currently have existing painful kidney or gallbladder situations, you probably will want to mix up two batches and drink it for 8 straight days. Make sure you have access to a rest room throughout the day since the herbs will increase the frequency of urination. Drink plenty of water due to the diuretic effects. Although a strict diet is not required on this detox, staying away from certain foods that contribute to kidney stones is important. Absolutely avoid sugar, especially high fructose corn syrup, sodas, and unfermented soy products such as soy milk and soy burgers. If you are prone to uric acid type stones, cut down on high-purine foods such as red meat, organ meats, and shellfish, and follow a healthy diet that contains mostly vegetables and fruits, whole grains while kidney detoxing. In fact, if you can, go vegan during the flush. Please send me complete guide how to flush out kidney stone permanently because kidney stones keep on forming back in my kidney due to high uric acid.Your immediate reply is highly appreciated.Thank you. Can I substitute either just apples or apple cider vinegar for the apple juice? The apple juice dilutes the tincture for flavor. You can substitute with water or a juice you like. Did the colon/heavy metal portion of the cleanse without a hitch. However, I'm seeing some interesting side affects of the Kidney Detox. I tend to get a "drunk" feeling for an hour or two after taking my initial mix of juice/water/kgbflush in the morning. I do this on an empty stomach, so I'll probably wait until I have food the remaining couple of days. In addition, the night after my 2nd day of the Kidney Cleanse, I got what I can only describe as feeling as if I've been punched in the stomach -- no nausea or gas, but all my other upper abdominal organs are "aching" with referred pain in my back. I also find that I need to sleep a lot more -- taking several hour-long naps during the day in addition to 8 hours of sleep at night. I'm a bit nervous about doing the Liver cleanse, so I'm scheduling it over a weekend just in case I get a bad reaction.